Australian magistrate; born in New York May 7, 1820; died 1884. Educated at Columbia College, New York, he was destined for the legal profession; but, evincing a distaste for the law, he left New York and went to Sydney in 1839. In 1841 he took up his abode in Melbourne, and for some years engaged in commercial pursuits. He took a prominent part in the search for gold-fields in Victoria. In 1854 he was appointed a commissioner of the supreme court. In January, 1855, he left Victoria for Europe, but returned to the colony in 1857 and was gazetted a territorial magistrate. Afterward he was thrice elected by the citizens of Melbourne auditor of that city. Through Hart's exertions a grant of land was obtained for a synagogue. Hart was honorary secretary of the East Melbourne congregation and its president for six years. 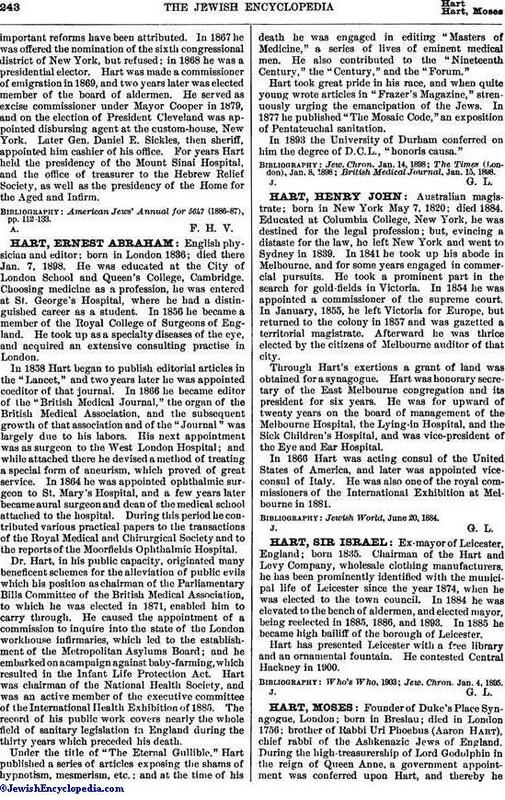 He was for upward of twenty years on the board of management of the Melbourne Hospital, the Lying-in Hospital, and the Sick Children's Hospital, and was vice-president of the Eye and Ear Hospital. In 1866 Hart was acting consul of the United States of America, and later was appointed vice-consul of Italy. He was also one of the royal commissioners of the International Exhibition at Melbourne in 1881. Jewish world, June 20, 1884.